Pretty Flamingos, Carloforte salt pans: Unfortunately your browser does not support the audio element. We actually stayed in Carloforte for a week - the weather played its part as usual as strong winds and thundery rain was forecast. In the event neither were as bad as predicted, but we could see that the sea state was less than comfortable, so were happy to stay put. We also received a discount, presumably for staying for a whole week. 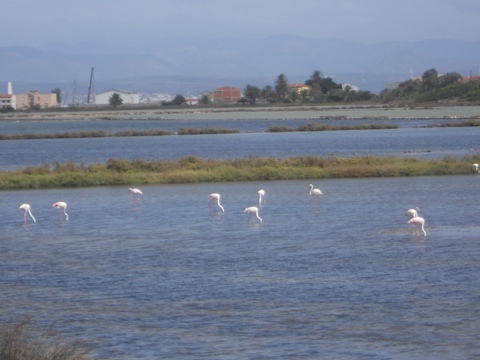 This gave us the opportunity to explore the island a little on foot, including walking round the above salt pans, now a nature reserve, where, as well as flamingos, we saw herons, egrets and other unidentified birds. Other inhabitants that we didn't see on the day include avocets and kingfishers. 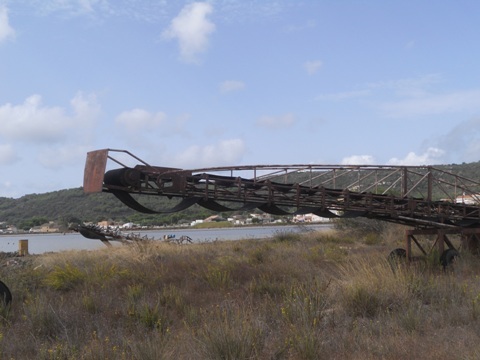 Salt harvesting machinery, which was still in use until the early 1990s. Although we were only on an island off an island off the mainland, we must surely have seen just about every possible combination of Fiat 500 spec, colour, trim & wheel combination there is: we have settled on red or white with black leather interior. Or black with light interior. Or maybe grey with light interior. Or perhaps yellow with black leather interior. Oh you decide here! One evening we treated ourselves to the local speciality of Pasta alla Carlofortina at a ristorante on the front. Basically pasta in a tuna & tomato sauce. 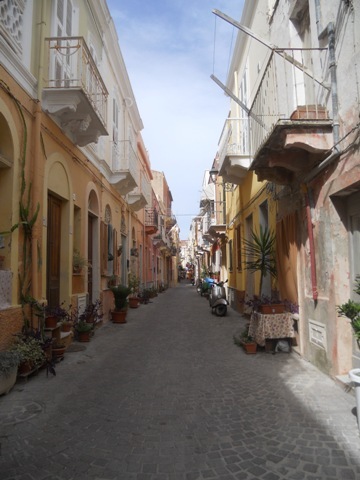 Carloforte's main industry used to be tuna fishing - now it's tourism. 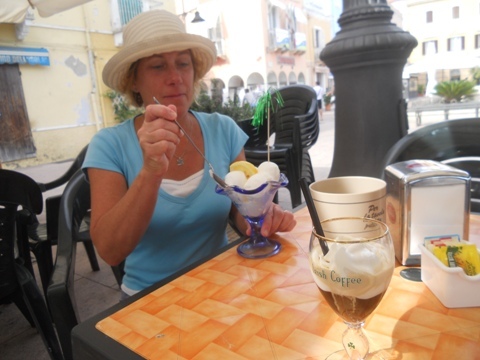 On Monday we left Carloforte in bright sunshine and headed for Teulada, about half way to Cagliari. A while later as we looked back at Isola di San Pietro it was becoming shrouded in cloud and heavy rain was falling. The skies to the west of us were looking threatening, but we managed to escape with just a few spots of rain - not enough to warrant even a jacket. We had a gentle sail most of the way, but wouldn't you know it - as we approached Teulada we suddenly had a F6 to contend with. There was supposed to be an anchorage, but it didn't look very inviting and so a little reluctantly we opted for a berth in the marina. The marina is quite new with decent pontoons & facilities, but it is pretty much in the middle of nowhere. This didn't bother us as we planned only an overnight stay, and at €18.60 for the night (it was October 1st!) we were happy. On Wednesday we found a reasonable supermarket and two chandlers, one particularly well stocked one where we bought a few things we actually do need and resisted a few we don't. 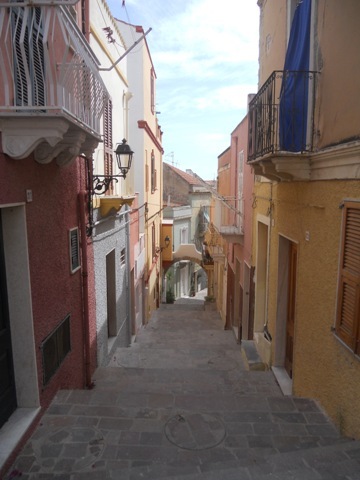 Yesterday we had a brief look round the old part of Cagliari and last evening were invited aboard Lazy Pelican, who arrived on Wednesday, for supper. A very enjoyable evening it was too. We shall probably move along the coast a few miles to Villasimius at the weekend, from where we'll cross to Sicily.